Worldwide smartphone shipments will rebound in 2017, according to the latest market study by International Data Corporation (IDC). While growth is expected to be consistent, IDC predicts shipment volumes to grow by 4.2 percent in 2017 and 4.4 percent in 2018 -- with a CAGR of 3.8 percent over the 2016-2021 forecast period. Furthermore, smartphone shipments are forecast to reach 1.53 billion units in 2017, and eventually grow to 1.77 billion units by 2021. From a platform perspective, IDC doesn't expect much change throughout the forecast with Google Android accounting for roughly 85 percent of all smartphone shipments, and Apple iOS making up the rest. That said, the outlook for Microsoft-based smartphones remains grim, given the lack of OEM partner support. Although IDC anticipates that Google Android growth will gradually decline, they do not yet see a point where shipments will contract year-over-year, given the demand for new features such as augmented and virtual reality. For Apple iOS, 2016 was the first time it experienced a year-over-year decline in shipments, with iPhone volumes falling a stunning 7 percent. IDC expects there could be a strong rebound in iPhone volumes in 2017, following the launch of its next set of devices. "We continue to get questions about longer smartphone life cycles given the number of markets with high penetration levels, but so far we are not seeing any trend in this direction," said Ryan Reith, program vice president at IDC. When you break down the market you have many different trends occurring. In some low-cost markets like China, we're beginning to see users gradually buying up to a more premium device. It's likely caused by poor satisfaction from previously owned devices, and demand for better feature sets. According to the IDC assessment, in mature markets, the premium space is as competitive as ever. This is illustrated by the number of high-end smartphone announcements at Mobile World Congress 2017. Despite the moderate 2.5 percent growth in 2016, phablets displayed 49 percent year-over-year growth as consumers continue to flock to big-screened devices in both emerging and developed markets. Phablets will undoubtedly be the main force driving the market forward, thanks to an abundance of feature-rich devices in both the premium and entry-level segments. 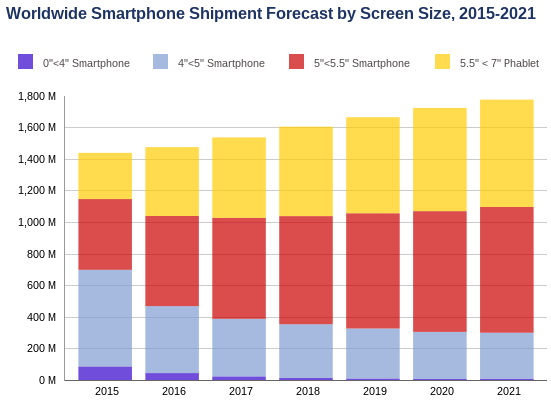 Total phablet shipments worldwide are expected to reach just under 680 million units by 2021, resulting in a compound annual growth rate of 9.2 percent for 2016–2021. 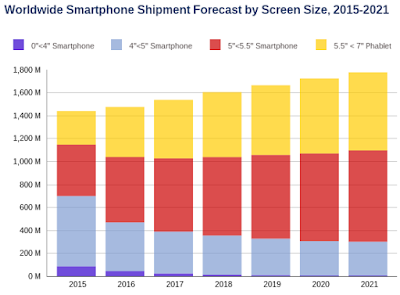 In comparison, regular smartphones will grow at a rate of just 1.1 percent during the same period, proving perhaps that bigger may be better -- or at least more popular when it comes to smartphone design choices.